Ships from and sold by COOSUN. STYLISH DESIGN: Cotton canvas material,quality zipper, strong resistant to pull, easy to use. It's Safe, Non-toxic, Eco Friendly, Wear-Resistant, Durable, Washable,Long-lasting. Cute and Stylish Pattern will make your handbag tote Unique and Personalized. ROOMY SIZE: 14"L x 4.5"W x 15"H/ 35.56cm x 11.43cm x 38cm, also works as a re-usable shopping bag or a day trip tote. EXTRA POCKET INSIDE: A total of 4 pockets. 1 zippered closure for the main compartment,1 inner zippered pocket and two small pocket. Handy inside pockets are a great place to store wallet, phone, keys, water or soda, etc. Machine or hand washing,no distortion, no fade. A fashionable reusable shopping bag! Be a green Eco friendly shopper! MULTI-FUNCTION USE:This fashion canvas handbag can be used as Tote Bag, Women Handbags, and Shoulder Bag with Specially Designed Double Different Handles. You can use it as Shopping Bag, School Bag, Tote Purses,and Beach Tote when in need. These sturdy tote bags are made of 100% natural cotton canvas. Reusable cotton canvas tote bag for grocery shopping are good for the environment and you don’t have to worry about them ripping or breaking.The reusable tote can be folded flat for easy storage in closets or front halls. 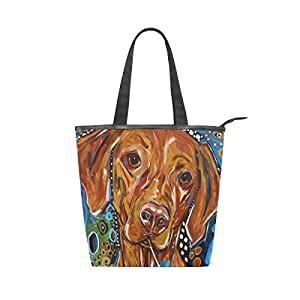 This canvas bags are perfect for groceries, shopping, school, beaches, picnics, farmers markets and so much more. The reusable cotton bags .Ideal for carrying groceries. Easy to carry and convenient for any shopping trip.It had been used for towels and swimsuits at the pool, or a change of clothing for the gym, better than recycled plastic bags.